At Ball Heating & Air Conditioning, our professional heating and air conditioning contractors specialize in air conditioning installations for any models, types, and brands. Whether you need the installation for a new construction project or you're upgrading your home, we can handle the job from start to finish. Our contractors are all licensed, trained, and experienced professionals, so we can guarantee your complete satisfaction with all of the work that we provide. We have experience working with all kinds of air conditioners, and we can even modify or enhance your Wichita home's ductwork if it's necessary for the new installation. We guarantee that the installation will be done properly and professionally, and we'll make sure that your air conditioner is running as efficiently as possible, which can improve your home's comfort levels and your energy efficiency. When you need to have any part of your heating or cooling system worked on in any way, you need a professional contractor you can trust with your Wichita home in their hands. Our professionals always guarantee high quality workmanship and professional customer service, and we'll always provide you with great customer service. We have years of experience working in the heating and cooling industry and we can make sure your AC installation is completed perfectly. We can handle the entirety of any air conditioning installation job from beginning to end. We'll remove your old AC unit and we'll modify your ductwork if necessary. From the initial steps through to the completion of the project, we'll handle absolutely every aspect of the job. When you depend on our air conditioning contractors for your installation, we'll make sure that you're able to keep your Wichita home cool and comfortable throughout the hotter parts of the year, and that your AC runs well and efficiently throughout the years. The installation of your air conditioning system is the first step that you'll take toward having an efficient and well-running AC. All air conditioners require repairs and maintenance, but a high quality installation will keep any problems with your conditioner to a minimum from the very beginning. Our professionals know how important your air conditioning system is to your home, and we'll do whatever it takes to guarantee that it's always in the best condition possible. We'll make sure that your Wichita home's air conditioner is installed perfectly so that no new problems crop up in the near future, and you have no repairs that are necessary for a long while. We also guarantee that your AC installation will positively affect your home's energy efficiency, and that it will be able to keep your home cool and comfortable at all times. 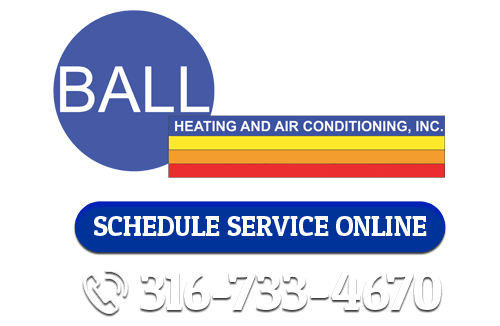 If you're looking for an air conditioning installation in Wichita, call Ball Heating & Air Conditioning at 316-733-4670, or fill out our online request form.